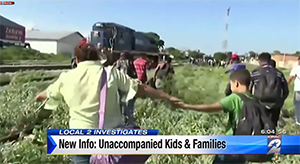 An investigative report by a Houston television station exposed that only a tiny fraction of the families and children who crossed in the border surge of 2012-14 are being returned to their home countries, despite Obama administration claims that the cases are a priority. According to immigration court records obtained by the station, only a few of the illegal family or child arrivals are qualified to stay in the United States, and the vast majority (91 percent) have simply absconded from their proceedings after release and joined the resident illegal population, where they are no longer a priority for enforcement under the new, expanded "prosecutorial discretion" policies. The Houston reporters obtained statistics from the immigration courts on 30,467 cases of families and unaccompanied alien children (UACs) who arrived illegally between July 18 and October 28, 2014. Of these, only 22 percent (6,093) have been completed. In total, 17,042 people were apprehended as family units; 13,425 were UACs. Of the 15,614 families caught crossing the border, but not detained, 4,197 have been ordered removed from the U.S. However, 96 percent of those removal orders were done "in absentia." The EOIR [Executive Office of Immigration Review] states an "in absentia" order is done when a person fails to show in immigration court. Out of the 1,428 families caught crossing the border and detained, 21 have been ordered removed. Forty-three percent of these orders were done "in absentia." Of the 13,425 unaccompanied children caught crossing the border between July and October, 1,671 have been ordered removed from the U.S. Ninety-two percent of these orders were done "in absentia." At least 92 percent of the family arrivals in this sample of cases were released after apprehension rather than detained in the border area. Nearly all of those (5,575 out of 6,093 total families and UAC cases completed, or 91 percent) subsequently failed to appear at their immigration hearings and are now part of the illegal population. According to these figures, 43 percent of those family members classified as "detained" (nine people) also failed to appear for their hearings, suggesting that they actually were released at some point. On December 19, DHS released its year-end enforcement statistics, showing a continued steep drop in deportations. The statistics were accompanied by this statement from DHS Secretary Jeh Johnson, which seems downright laughable in light of the above facts: "DHS's 2014 year-end enforcement statistics demonstrate that our front line officers and agents continue to execute their critical mission in a smart and effective way, focusing our resources on convicted criminals and those attempting to illegally cross our nation's borders." It's not clear to me what is smart or effective about a massive and costly catch-and-release scheme that has resulted in the illegal resettlement of tens of thousands of illegal aliens, with taxpayers now picking up the tab for schooling, health care, housing, public safety, and other expenses, and which has only increased the incentives for more people to try to enter illegally. In the context of current catch-and-release policies, a focus on border apprehensions as a measure of the effectiveness of border security is meaningless, and deliberately misleading. Apprehensions are not a metric of enforcement when illegal aliens are apprehended and then routinely released under the guise of "deportation proceedings", "asylum applications", or even "budget constraints". Further, any proposals that claim to want to enhance border security and enforcement by providing more resources, more personnel, more technology, and more infrastructure for immigration agencies without addressing the underlying policies that serve to undercut enforcement should be viewed with great skepticism. The imperative now is true immigration and border enforcement: more deportations, not just apprehensions, of not only criminals, but recent and not-so-recent arrivals, at the border and in the interior; provisions to prevent illegal employment and access to welfare benefits; a more efficient deportation process without unnecessarily protracted due process; restoration of effective partnerships with local law enforcement; and use of soft detention as a deterrent. These should be among the top priorities for the new Congress.